The largest ghost town in the world – formerly a city of ca. 100,000, now totally deserted and in ruins, standing (well, only partially) as a most eerie scar left by the Nagorno-Karabakh war. More background info: Agdam was a predominantly Azeri city in the west of Azerbaijan, near the Armenian enclave of Nagorno-Karabakh. The figures given for the number of inhabitants vary in different sources, usually between 50,000 and 150,000, so the middle is probably a good approximation to the facts. In any case at ca. 100,000 it was a city, not just a town, in fact the largest of the region, about twice the size of Karabakh's "capital" Stepanakert today. With that size it is also twice as big, population-wise, as what is probably the world's best-known ghost town, namely Pripyat near Chernobyl in Ukraine. Furthermore, Agdam covers a much larger area, since housing wasn't as concentrated in high-rise apartment blocks (as in Pripyat) but much more sprawling. Unlike with Pripyat, however, the reason for Agdam becoming a ghost town was not an industrial/nuclear accident, but war. The entire population of Agdam had to flee in 1993 in the later stages of the Nagorno-Karabakh war, when battle fortunes turned away from the Azeris and in favour of the Armenians. For more background info about the war see under Nagorno-Karabakh. The deserted city of Agdam was taken in July 1993 and the Armenian military still has control over it, since it falls within the "buffer zone" that in the ceasefire agreement of 1994 was set up between the front line, just on the eastern edge of Agdam, and the territory of Karabakh proper. Many of the city's former Azeri inhabitants still live in "temporary" IDP ('internally displaced persons') accommodation in various places in Azerbaijan. No one lives in Agdam today. It's completely abandoned. Meanwhile, the buildings of Agdam have fallen into ruin. It is not entirely clear how much of the destruction occurred as part of the war (through shelling) or afterwards. One thing is certain: the people of Nagorno-Karabakh (esp. Stepanakert) used the deserted city of Agdam as a free source of construction materials to rebuild their own houses, which is at least partly understandable. Scrap metal hunters are said to still scavenge for cables or plumbing pipes – though you have to wonder whether there's still anything of value left – it certainly doesn't look it. The only structure that is still halfway intact, compared to the roofless shells of the rest of the city's buildings, is the mosque with its two intricate brick minarets. It was largely spared destruction during and after the war, but of course years of neglect have taken their toll on this structure too. I've seen images online of graffiti and even cattle inside the mosque – you can also find online videos, e.g. on YouTube, of ruined Agdam and its mosque. A note about the city name's pronunciation: the 'g' is pronounced like something in between a 'h' and a soft guttural 'r' (in Turkish it would even be silent altogether, but Azeri retains a remnant of the sound). And finally a "sports trivia" note on the side: remarkably, Agdam still has a professional football club! It's called "Karabakh Agdam" or "Qarabağ Ağdam" in Azeri spelling. And that despite the fact that it has been operating "in exile", as it were, since 1993. Most matches were played in Baku until recently, now in a town closer to the border. And it's a successful team too: at home they won both the Azeri premier league and the cup repeatedly, and it is also the most successful Azerbaijani team in European championships ever! In the 2010 UEFA Europa League it got as far as the fourth round until being defeated by German biggies Borussia Dortmund! What an irony, given that the club hasn't had a home ground at home for so long! What there is to see: basically just a sea of ruins stretching to the horizon. Some house ruins are more remarkable than others, especially those that still give an indication of two- or three-storey houses, while most of the lower-level ruins of former single-storey buildings wouldn't be much to look at individually. It's the mass that makes it here! It could be the set for a disaster movie – but of course it is quite real! The old mosque in the city centre is probably the main focus point – also because one of the twin minarets can, or at least could in the past, be climbed to get an aerial view over the sprawling sea of ruins. The Lonely Planet guidebook ("Georgia, Armenia & Azerbaijan" 2008, p.301) goes as far as saying that the view is similar to "photographs taken of Hiroshima" after its 1945 A-bombing. Apparently this is what journalists have said on visiting the ghost town – it's also invoked in a recent short film about Agdam entitled "Caucasian Hiroshima". That kind of likening Agdam to Hiroshima is, however, quite an exaggeration in my opinion, since Agdam is not a flattened, charred desert with only the odd concrete shell in it, which is what the appearance of Hiroshima was after the bomb. Agdam, in contrast, is actually even quite green: overgrown and with trees appearing in between the ruins (or even inside them). Nature is busy reclaiming this wasteland, while at the same time the old ruins, exposed to the elements for years, are slowly crumbling. In that respect it rather resembles Pripyat near Chernobyl – though Agdam was by no means as high-rise dominated (and is much less "intact"). You can just about make out some higher apartment block ruins in the distance – beyond where you can actually go, i.e. nearer the front line. Incidentally, I should emphasize that strictly speaking you can't actually just go to Agdam at all. At best you can sneak in. You are not supposed to enter the "buffer zone" that Agdam is located in, i.e. the Armenian controlled area between Nagorno-Karabakh territory proper and the "front line" with Azerbaijan – the Karabakh visa does not cover those parts. See below for more details. Many intrepid travellers have gone in all the same, though. And usually without any incident. The general advice is not to proceed any further east than the mosque, i.e. not towards the front line that goes right past the eastern and northern outskirts of the ex-city. But even that can still be a bit dicey. You might be stopped and questioned or even arrested by the military. How far you can risk going also varies with time. When I visited in August 2010, I was actually strongly advised not to go into the centre of the city at all (i.e. not even as far as the mosque), since the situation had become very tense following some recent skirmishes on the front line. And of course you'd better follow such local advice. 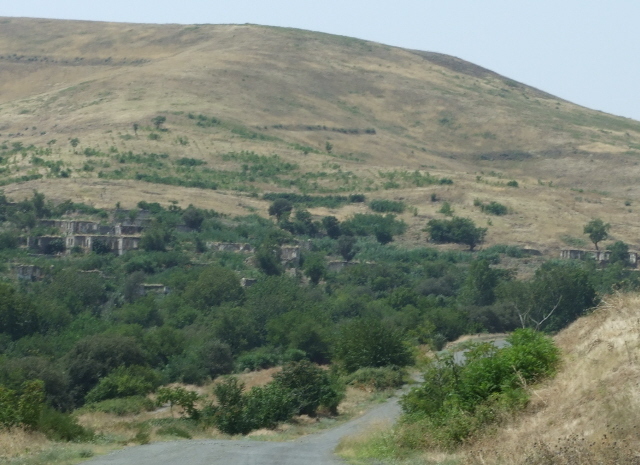 I was, however, driven through Agdam up to the point where the road leading south to Martuni and Fizuli branches off. It's already eerie enough. The closer you get to the city, the denser the rows of ruins become. The mosque's twin minarets, however, I could only see from a distance. The photos of the mosque that appear in the gallery below are thus not mine, but were passed on to me from an earlier traveller (anonymously) through the guy who organized my Agdam trip. Speaking of photography – nominally, it's not welcome at all. Not surprisingly so, if you're not even supposed to be there. Given the military sensitivity of the place you should most definitely not get caught snapping away here. If you risk it at all, make sure you do so with care – surreptitiously, and after making sure that there are no military vehicles around or anyone else who could be watching you. Location: some 10-15 miles (15-25 km) north-east of Stepanakert, Nagorno-Karabakh. Access and costs: officially there's no access at all, but it's not completely impossible to go there (by taxi – for a price). Details: The official line is quite clear: you are nominally not supposed to go to Agdam, or in fact anywhere in the "buffer zone" … but some people do so regardless. There's conflicting advice on this. Some say you need to get permission and be accompanied by Armenian soldiers if you want to have a look around, and especially if you want to take pictures – although this may be possible only for a few select people such as accredited journalists. (I was talked out of even trying that approach.) Others say you could simply get a taxi, but may not be allowed to take photos – apparently depending on the disposition of your driver. The Lonely Planet "Georgia, Armenia & Azerbaijan" guidebook's stance (p 301 in the 2008, edition) is this: while it would be foolhardy to just "waltz in" on your own, it is possible to get a taxi there from Stepanakert – but there is "no guarantee you won't be arrested". Given that kind of status of the place it may be debatable whether going to Agdam can still be regarded as legit dark tourism or whether it falls on the other side of the demarcation line and should be classed as danger tourism (it has to be regarded as adventure tourism in any case). Here's my own assessment/experience: when I went, in August 2010, I was merely cautioned to keep away from the city centre (around the mosque) and to be very careful when taking pictures, but I was driven at least through the western and southern outskirts of Agdam without any problems. There was even the odd other vehicle about but no one seemed to care much about our taxi. To the south outside Agdam we even passed a couple of military vehicles, but, again, nothing happened. So maybe it's not as dramatic as some sources make it out to be, or maybe I was just lucky. I admit, there was a certain underlying feeling of "adventure", but no palpable air of any real threat. My driver was perfectly relaxed – and didn't even care that I (surreptitiously) used a little compact digital camera … though obviously I abstained from using it when any military presence was in sight. After Agdam we proceeded, without any problems, past Fizuli and drove on to Shushi. Another thing: as I was sitting in the front passenger seat, the views out of the window of the taxi and thus the "photo ops" available whilst driving en route to Agdam, and then driving past it southbound, were not so good much of the time (and this shows in the photo gallery below). My advice would therefore be: have the driver do the round trip in the other direction, i.e. from Stepanakert first head south towards Hedrut and then north, via Fizuli, to enter/pass Agdam to the right. That way you can see it much better from the car and potentially get better photos. Originally, I was meant to have an English-speaking local guide to accompany me on the tour. But when I got to Stepanakert I was told that she had just got married and thus wasn't available for my tour – good for her, but unfortunate for me. On the other hand, it made the trip – without guiding – a lot cheaper. Still, it would probably have been better with a guide. As for the costs, then: it will be a matter of negotiation. With guide and driver for a full day I was originally quoted 70,000 AMD – but in the end, without guide, it was significantly less (I think only 20,000 or so, but can't remember exactly). If you can find a driver yourself and haggle you may even get it for less. Time required: the drive there and back wouldn't take too long, maybe half an hour each way, but depending on how far into the ghost town you can proceed and how much time you may want to, or are allowed to, spend there, it can be a couple of hours. Also: if you get as far as the (outskirts of) Agdam, you probably want to do the drive past the other, smaller ghost towns of the area too, esp. Fizuli south of Agdam. That would make it at least a half-day round trip. Combinations with other dark destinations: in general see Nagorno-Karabakh – the most obvious combination is to not just go to Agdam and back (from/to Stepanakert), but to extend the excursion to take in more of the area out east and drive along the plain below the foothills of the Karabakh mountains. Note, however, that this involves more driving through parts of the "buffer zone", i.e. the Armenian-military controlled formerly Azerbaijani area which your Karabakh visa does not officially cover. It's thus of similarly dubious legality to roam around here, but much less of a sensitive issue than Agdam itself. In any case, you should always stay on the main road. Towards the south-easternmost part of the route, close to the border with Iran, you'll pass through the small town of Fizuli. Just like Agdam, this former Azeri provincial capital was lost to Armenia in the Karabakh war and remains under Armenian military control. It too is a ruined ghost town – though not on the same scale as Agdam. In addition, all around the area you'll see plenty of similarly abandoned settlements that are even smaller still, along with ruins of completely isolated former farms. There are also forlorn, crumbling Soviet (ex-)monuments as well as rusting skeletons of buses and other vehicles by the roadside. All this adds to the eerie atmosphere of an empty, post-apocalyptic wasteland. Here and there, however, there are also pockets of life – and fields that farmers work in (even growing wine again). And inside Karabakh territory proper there are little market towns such as Martuni, which have regained an air of rural normality; quiet and isolated, but without any real signs of the recent war. Combinations with non-dark destinations: see under Nagorno-Karabakh.